*Afor Y telle þis tale off loffe, Yhaf a tale off woe. And so to auctores & patrones Y didde goe. & seyde, “Helas! We wille nat playe. A tale of loffe qwiche Y knawe welle. Ane litel & swete, t’othere al groun. Litel Hare watz redy forto go to bedde. ‘Gesse hou moche Y loffe þe’. Litel stretchyd hys armys: ‘Y loffe big as þat’. Y loffe þe þys far, and t’is furþer þan þou’. Litel broun hare noddyd hys hede. ‘Bote stille mo Y loffe þe’. Bot Y loffe þe þis heiʒe & am mo heiʒe þan þou’. And saide ‘þys moche do Y loffe þe’. He stod on hys handes wyþ fete in þe aire. ‘Y loffe þe þys moche’, saide Litel Broun Hare. Saide wei, ‘Bot Y loffe the’. & þe hares stod yn þe moon liʒt. 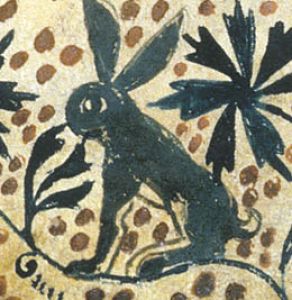 Said Big Hare, ‘Ywis, þat ys for!